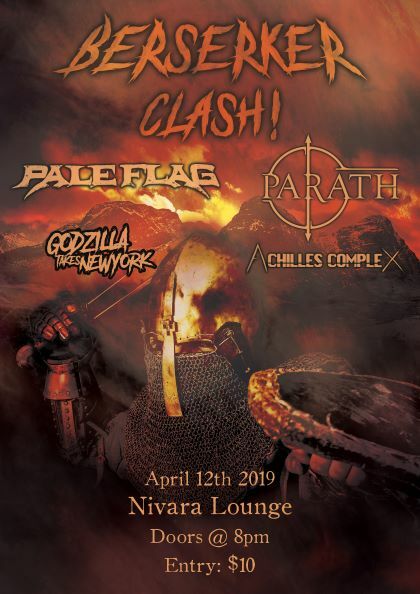 Come see four epic heavy bands play at Nivara Lounge! The Achilles Complex is an alternative heavy rock band from Hamilton. They will captivate you with gritty bass and drum driven riffs coupled with powerful vocals; making them a band that you will definitely not want to miss. Based in Auckland, Godzilla Takes New York play a unique genre blend of metalcore and extreme metal. Mixing an atmosphere of orchestral strings with driving guitars riffs, GTNY will certain bring the moshing to a climax. With lyrics about well-known movies and pop-culture phenomenon, you’ve definitely never heard any other band like them before. Parath is a symphonic metal band based in Hamilton. Combining fierce guitar riffs with full orchestral arrangements, Parath aim to give you a musical experience that you have not encountered before. From blast beats to breakdowns, Parath will deliver the goods. Pale Flag is a heavy metal band from Auckland, New Zealand formed in 2018. Having only been together for a very short time, the band has already opened for several notable local and international acts. Known for their high energy live show, Pale Flag’s hard hitting music will have you headbanging like never before.